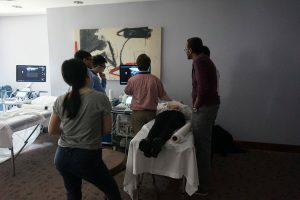 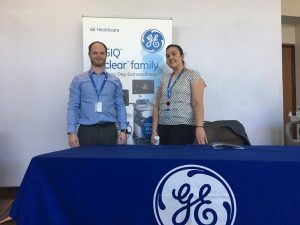 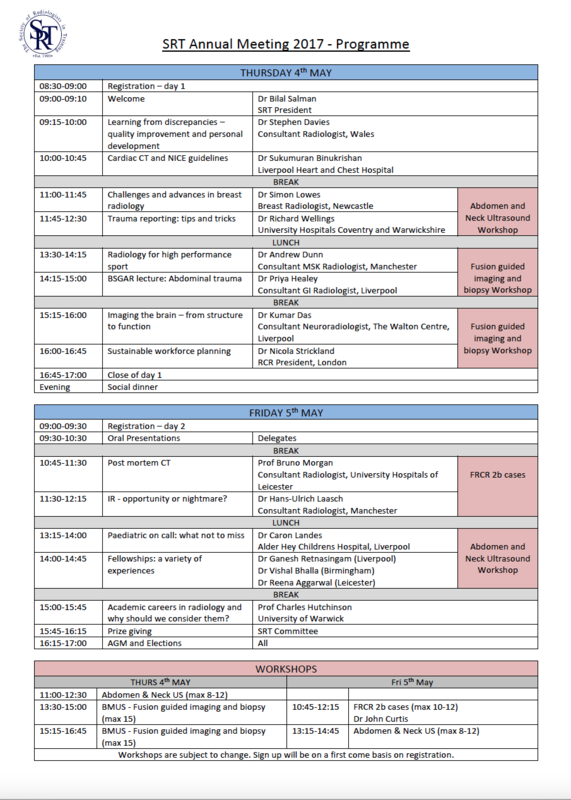 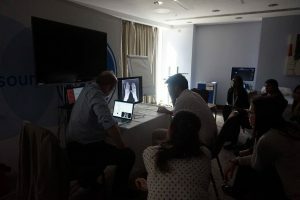 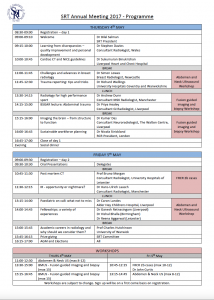 The 2-day conference included an exciting programme specifically tailored to radiology trainees and offered workshops in ultrasound and FRCR 2b exam preparation. 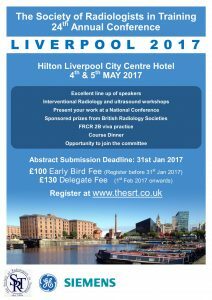 Please see our programme for Liverpool 2017 and check out our facebook group SRT Liverpool 2017 photo album. 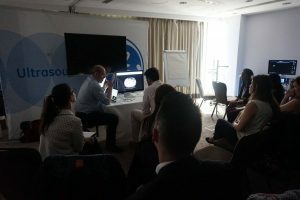 Every year we accept the top 50 abstracts and this year was no exception with the high quality of submissions we received. 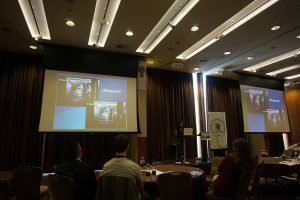 The SRT provides a great platform for trainees to show case their work and present at a National conference. 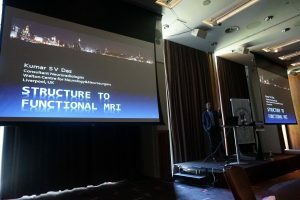 The poster prizes are sponsored by the British Radiology Subspecialty societies and include cash prizes with free attendance at their scientific meetings. 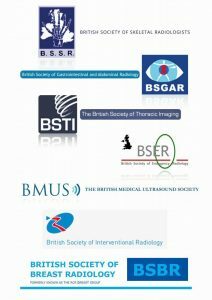 This year the posters prizes were sponsored by BSGAR, BSSR, BSBR, BMUS, BSIR, BSER and BSTI. 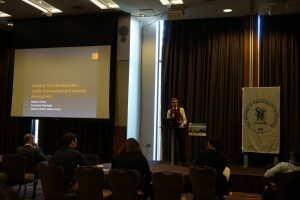 5 Oral presentations were chosen to present on the second day of the conference and Consultants judged these on the second day of the conference. 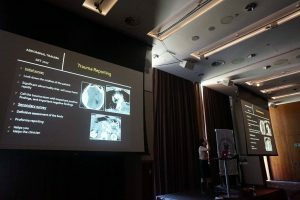 Furthermore The SRT had more prizes to give away for categories such as Best Scientific poster, Best Oral presentation and, of course, the popular SRT Picture Quiz! 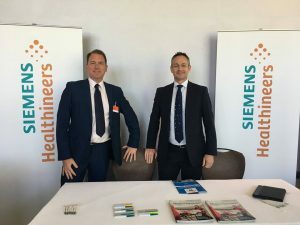 GE and Siemens sponsored the event this year and as ever we are very grateful to our sponsors for allowing us to make the event a success. 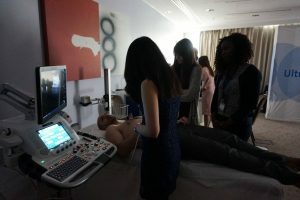 GE provided us with 4 state of the art ultrasound machines, which enabled us to run workshops on both days. 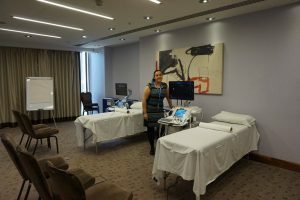 JP medical also provided us with radiology books to give away as prizes for our winners. 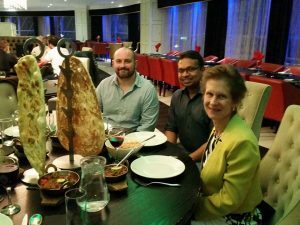 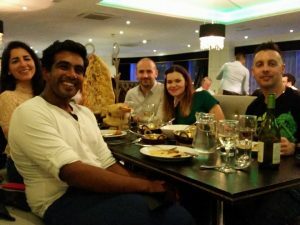 Our social event was held on the first evening of the conference in the East Z East Restaurant in Kings Dock, Liverpool City Centre and it is a great opportunity to network with delegates in a relaxed environment after a full day of lectures and workshops. 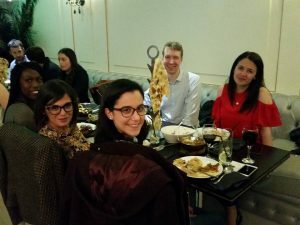 Dr Nicola Strickland and other Consultant speakers also attended the social and are always interested to hear trainees’ views. 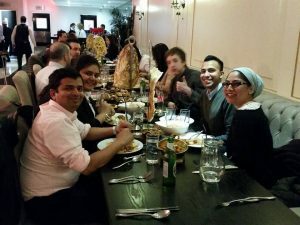 Here are some photos from our social event.